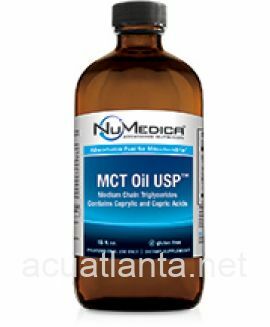 MCT Oil USP is a high quality blend of medium-chain triglycerides (MCTs). MCTs are special fatty acids which are metabolized more fully for energy in the body. Normal fats and oils contain long-chain fatty acids (LCTs). When compared to these fatty acids, MCTs are much shorter in length thus resembling carbohydrates more than fat. As a result, they are more quickly absorbed by the body and metabolized as fuel. Because of this quick metabolism, the calories in MCTs are very efficiently converted into fuel for immediate use in the mitochondria, instead of being stored as fat. MCT Oil can also be used as a substitute for conventional oils in salad dressings, sauces or cooking as a source of beneficial fatty acids. It is not recommended for use in frying due to its low boiling point. Ingredients: 100% USP (United States Pharmacopeia) Compliant MCT Oil (from coconut oil). Caution: May cause a mild laxative effect. Keep out of reach of children. Directions: Take one tablespoon one to two times per day or as directed by your healthcare practitioner.